Quick Answer: Francis Ford Coppola's The Conversation is a psychological thriller and a character study of the paranoid protagonist, wiretapper Harry Caul. Caul rarely speaks, but his uneasy mental state is conveyed through the film’s cinematography and sound design. Long shots of Caul walking in the urban landscape of San Francisco depict his loneliness, while the use of sonic distortion and repetition render Caul’s anxiety in the medium that dominates his attention: sound. 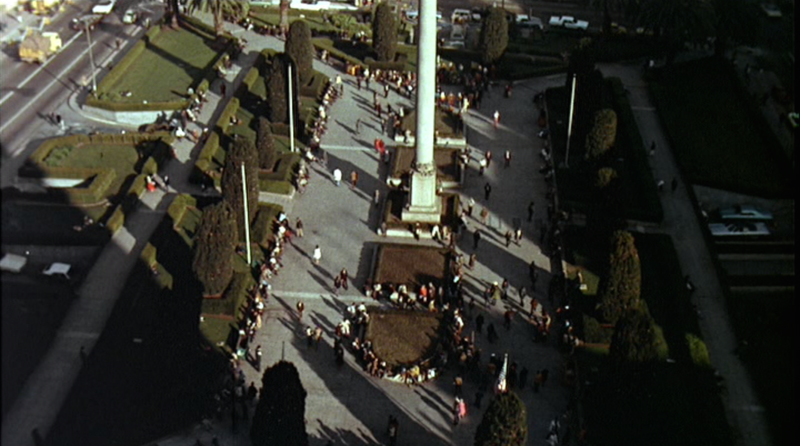 Francis Ford Coppola’s The Conversation (1974) opens with a shot of San Francisco’s Union Square from above. As the camera slowly descends on the park, we hear familiar city noises — the cacophony of laughter, chatter and music from a busking jazz band — but it is unclear who or what viewers should focus on. The camera zooms in on the crowd and begins following a mime who imitates a man in a trench coat as the man drinks coffee from a paper cup. The man, visibly uncomfortable, briskly walks away to shake off the mime, when a strange beeping sound interrupts the scene. This is the first aural cue that something is going on here — that someone is being recorded. We see a man crouched on a nearby roof, and then a young couple captured in the lens of his sniper-like camera. Suddenly, viewers slip into the position of voyeurs, watching the young couple as they are being watched. The opening scene of The Conversation sets the stage for the film’s theme of paranoia induced by the awareness of surveillance, on the parts of both the watcher and watched. The man in the trench coat is wiretapping expert Harry Caul (Gene Hackman), and he and his team are surveilling the young couple (Cindy Williams and Frederic Forrest), not for any personal reason but because they were assigned to do so by a new client. In this opening scene and others throughout the film, the careful cinematography and sound design convey Caul’s isolation and paranoia about the potential fate of the young couple, as well as his own fate. As Caul comes to believe that he himself is being watched, his obsession becomes his downfall. While cinematographer Haskall Wexler set the tone for the film with the ambiguous, unsettling opening sequence in Union Square, the rest of The Conversation’s visuals are the product of Coppola’s partnership with Director of Photography Bill Butler. The film’s paranoid protagonist lives a secretive and lonely life. He records whoever his clients ask him to but insists that he is uninterested in the content of their conversations — he only wants “a nice fat recording” and says that he does not feel responsible for the tapes once they are out of his hands. His personal life consists of solitude in a small apartment where he plays the saxophone accompanied by the sounds of other instruments produced by his record player. Caul doesn’t speak much, but through Butler’s thematically composed shots, the character’s emotional inner life surfaces. Several long shots follow Caul moving through the urban landscape of San Francisco alone, while tight shots of his face reflect the ruthless grip of his isolation. As tension builds in the film, the close-ups of Caul become increasingly claustrophobic. The sound design of The Conversation achieves the film’s delicate balance between a psychological thriller and an in-depth character study. Caul is a man in the business of eavesdropping, or searching for illicit sound. The sounds of his recordings — from the snippets of conversations devoid of context to the high pitch beeps and frustrating white noise — are crucial to understanding his psyche. When Caul plays back the recording of the young couple’s conversation in the park, he hears a piece of dialogue that leads him to believe they are in danger: “He’d kill us if he had the chance.” This sentence alone launches him into a dizzying moral dilemma, a lethal cocktail of fear and guilt, and the repetition of this phrase throughout the film passes his paranoia on to the audience. Everywhere he goes, the sound bite rings in his ears: "He'd kill us if he had the chance." 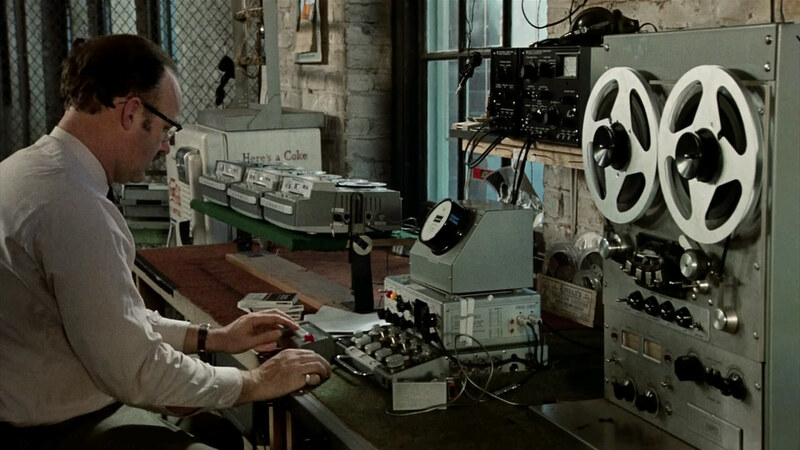 In the biography Gene Hackman by Allan Hunter, Coppola explained the film’s sound design and this use of repetition: “I wanted to make a film about privacy using the motif of eavesdropping and wiretapping, and centering on the personal and psychological life of the eavesdropper rather than his victims. It was to be a modern horror film, with a construction based on repetition rather than exposition, like a piece of music.” To help him achieve this goal, Coppola hired Walter Murch, who he had worked with on The Rain People (1969) and American Graffiti (1973), as both the sound designer and co-editor of the film. For his work in The Conversation, Murch was nominated for an Academy Award for Best Sound, and many critics regard the 1974 thriller as Murch’s film much as it is Coppola’s. In an interview with Film Sound, Murch discusses the relationship between image and sound on-screen: “Sound has a great power but it is a conditional power. It places the image in a physical and emotional context, helping us to decide how to take the image and how it integrates itself into everything else.” Murch's sound distortion sets the mood of the film, along with the solo piano-driven score by Coppola's brother-in-law, David Shire. While viewers have no access to Caul’s interiority (aside from the scene of a guilty nightmare), the film’s style — the combination of Butler’s lonely cinematography and Murch’s eerie sound design — renders his mental state and evokes the anxiety of his uncertainty in viewers. Everything we see and hear reflects the state that Caul is in. At the end of the film, we learn that the young couple Caul believed to be victims of a murder plot were, in fact, plotting a murder themselves. It was not “He’d kill us if he had the chance,” but “He’d kill us if he had the chance.” Caul misinterpreted the sentence that never left his head. It was only a matter of emphasis. The Conversation ends with a scene of Caul alone in his apartment, after he pieces together the facts of the murder that he predicted wrongly. The phone rings once, and there’s no one there. The phone rings twice, and he hears the voice on the other line say, “We know that you know, Mr. Caul….We’ll be listening to you.” Slowly and carefully, and then panicked and crazed, Caul searches every corner of his home until the wallpaper is peeled off the walls and the floorboards torn apart. 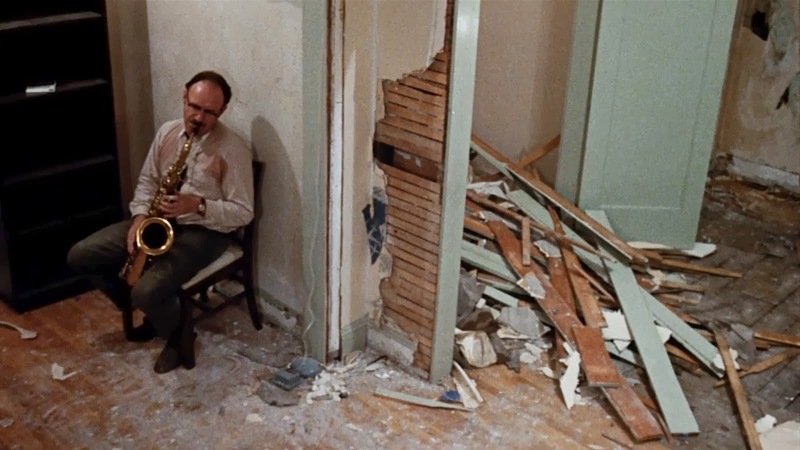 In the final shot of the film, the camera rotates back and forth from above — like CCTV — as Caul plays the saxophone in his dismantled apartment. But now, it feels like he is playing for an audience.